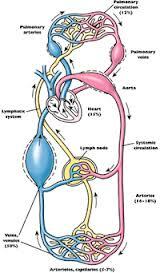 www.pendidikanbekam.com - human circulatory system is called a closed circulation because blood flows in the veins. Circulatory system in humans also called duplicate because the blood circulation through the heart 2 times. Circulatory system in humans include: heart, blood vessels, and blood. - Left ventricle bigger as the hardest working, which pumps blood around the body. - The right side of the heart (right atrium and right chamber) containing gross blood (CO2), while the left heart (left atrium and left ventricle) contains a lot of clean blood (O2). Blood vessels are divided 2. 2. The blood vessels to the heart: veins / vein. - If the injured arterial venous blood that dripped memenacar. Components of the blood consists of blood plasma (fluid) and the cells making up the blood. 95% of blood plasma consists of water. In blood plasma contained a blood clotting factor, ie protombin and fibrinogen. Blood plasma without fibrinogen is called serum. platelets play a role in blood clotting. Wound, platelets rupture -> trombokinase -> protombin (with the help of calcium and vitamin K) -> thrombin -> fibrinogen -> fibrin threads. 1. Anemia: lack of red blood cells (erythrocytes).